Of all the tattoo designs, it is perhaps the infinity tattoo designs that I love and wonder whether it is true for other girls as well! Well, as a matter of fact, women do prefer to get infinity tattoo designs inked on themselves since these look very beautiful and are simple at the same time. There are myriads of tattoo designs of which, some are meaningful and are related with some religion, while there are hundreds of others that are just simple designs that do not symbolize anything. Among such tattoo designs is the humble infinity tattoo that apart from looking nice, also bears a certain meaning. Most girls prefer to get these infinity tattoo designs as these are not attached to any faith and perhaps this is one greatest attribute associated with an infinity tattoo. Anyone on this planet can comfortably get infinity tattoo ideas carved on their bodies without bothering about what religion one follows. But, what does an infinity tattoo signify, you may want to ask? To begin with, there are certain individuals that believe that an infinity tattoo is a sign used by mathematicians, while, to others, it signifies the ever continuing cycle of birth and death. The infinity tattoo looks like two knots that are entwined with each other and are in the form of a loop that signifies that human beings or for that matter, any living being on this planet never ceases to exist even after its death. The physical body might get destroyed, but it is the soul that carries on further and takes rebirth into another life. With such a powerful concept attached to an infinity tattoo, most folks try to get this inked in all possible forms and tones. Infinity tattoos are respected in all faiths as I have mentioned above. Hinduism believes in it as much as Christianity and other faiths. That is one reason why we see so many people flaunting infinity tattoo designs on themselves, accompanied with different motifs. Infinity tattoo ideas are varied, each bearing a different connotation than the other. Such tattoos are commonly seen on couples that ink their bodies with cool infinity tattoos, often accompanied with hearts. Looking at these, you may wonder why a heart should be entwined with an infinity sign? The answer is pretty simple and logical since an infinity symbol signifies never ending existence of love and life, and hence, when you get a heart etched besides or with an infinity motif, you are making a statement to the world saying ‘Hey …our love is eternal and will never get erased’! 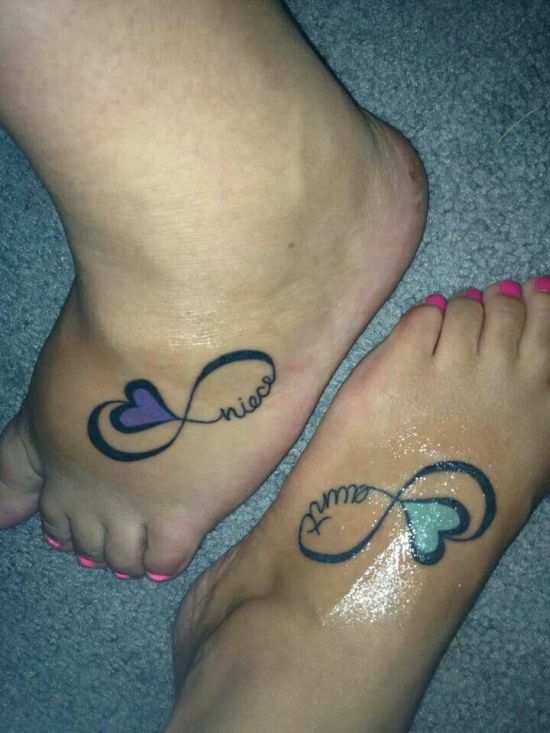 This is the beauty couples see when they get infinity tattoo designs etched on themselves. Infinity tattoo ideas are not just desired by couples in love, these tattoos are equally liked by siblings, fathers and daughters, mothers and sons and so on. Infinity tattoo ideas are a means to show one’s never ending love and commitment to a relationship. Now, as far as getting infinity tattoo designs inked on your bodies is concerned, doing it isn’t a very big task. These infinity tattoo ideas come in myriad shapes and styles depending on what you want on your body. One can get these lovely tattoos inked on any part of the body, like, behind the ears, fingers, back, neck, arms, foot and hands. Most often girls get these designs inked accompanied with other motifs such as hearts, stars, birds, anchor and cross. A bird accompanying an infinity tattoo signifies freedom while a cross may symbolize a person’s belief in his or her religion. Nevertheless, infinity tattoos are fantastic to be carved by girls of any age as these are pretty and simple in looks. Take a look at today’s post as it will cover 45+ infinity tattoo ideas for girls that are cool and are hot favorite among pretty ladies!